1, 2, or 3 mile walks for seniors. Hawks Pointe is a large housing tract north and east of Beach Blvd. and Rosecrans. 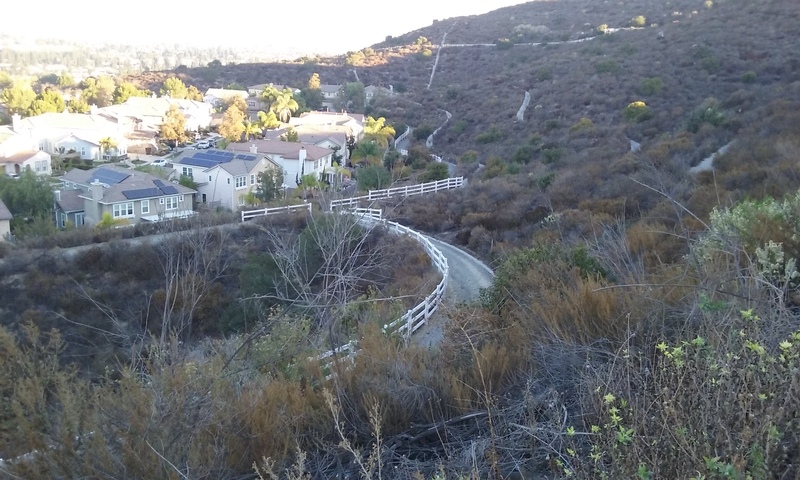 They are pretty expensive homes and one of the perks for living there is the extensive trail network on the hill above the homes. The hillside the trails are on is taken care of in the form of weed abatement and miles of U-channel to protect the hillside (and the residence) from erosion. Above the trails for Hawks Pointe residence is a wide trail with guide rails owned and maintained by County Parks. (Facilities for maintenance is stored across the street at Clark Park.) 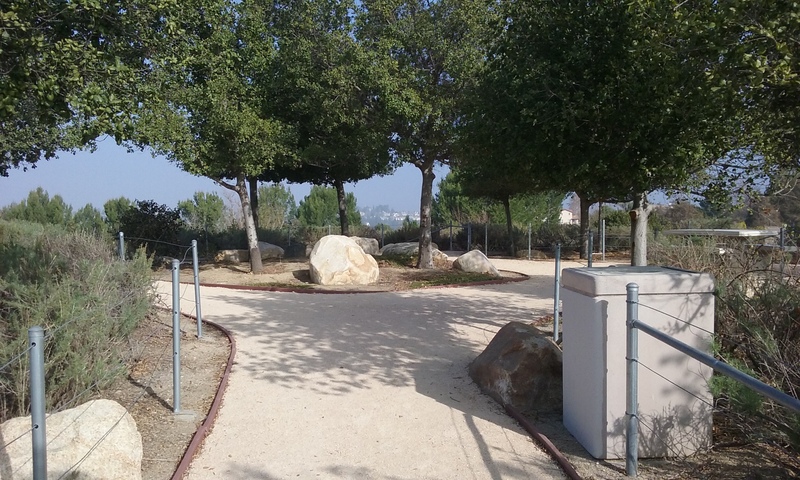 The trail for the public starts on Rosecrans across the street from Clark Park. 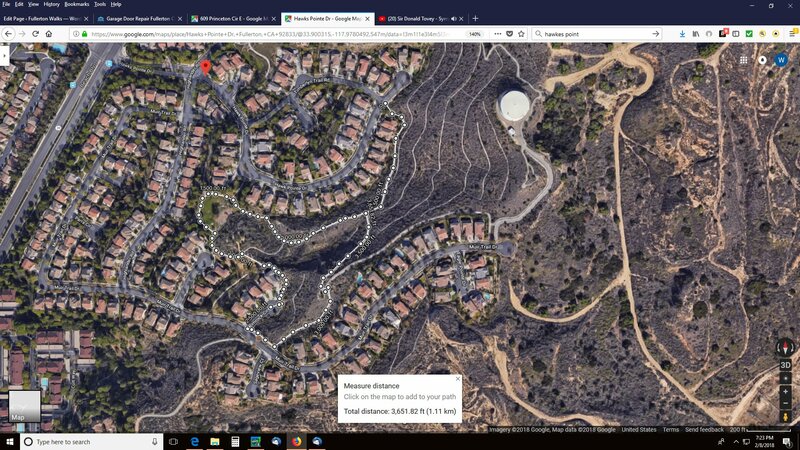 It goes up and around a large water tank and then down to street level a few hundred feet into La Mirada. The best place to park is the parking lot for the baseball fields to the north of Clark Park on Rosecrans; a few blocks east of Beach. There’s a problem though. It’s only open when there’s a pair of teams there that have rented the facility. So the next best place to park is along Rosecrans on the south side of the street. If you were able to park in the ball field parking lot you can walk west to the trail by walking behind third base line of the farthest west diamond. The grand entrance on the street is where you enter if you jay walk from parking on the south side of Rosecrans. Highest point before Muir Trail Drive. Wood railings guide you on the first half of the walk. This trail is most famous for its width, and guide rails. It also has a view (south-west, west and north-west). But it is also hilly which of course means exercise. The best views are near the water tank which is only half way. An out-and-back to the water tank is 1 mile. To get the full 2 miles walk, means the end is not the goal. The end is merely a col-d-sac of a road and all that marks the end is a sign that lists what you are not to do on the trail. The view of the cityscape west (in the morning) is breathtaking. Looking east should theoretically be a spectacular view of West Coyote Hills. But the slope is such that it is hidden by the hill in front of you, so it can’t be appreciated. Hill in the back is a possible view point for looking south and east. Note the white plastic guide rails on back half of the walk. And you walk on rock instead of decomposed granite. About a third of a mile uphill from the ball-field where you entered, the trail starts going back down and crosses Muir Trail Drive where it starts up again. North of Muir Trail Drive the trail changes its name from Hawks Pointe to Muir Trail. It is also a bit different in style (plastic rails instead of wood) so the difference may be several years between them being made. This Muir Trail part has three excellent rest stops with large boulders to sit on. The rest stops were chosen mostly for their view. There’s a trashcan at each of the rest stops but none at the ends. That’s important to know if you like to pick up trash as exercise. Near the highest point you will go around a large water tank. This is part of 11 tanks of the Fullerton Water Department. 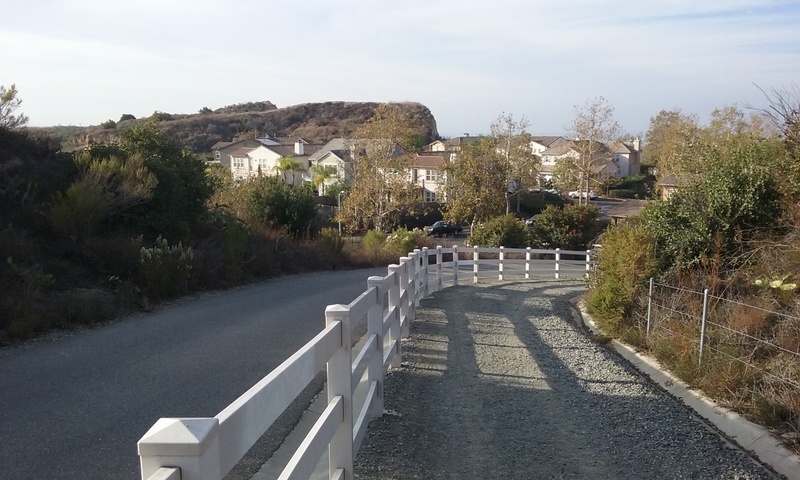 If you continue on, the trail goes downhill to the not very dramatic end; a road named Laguna Street. 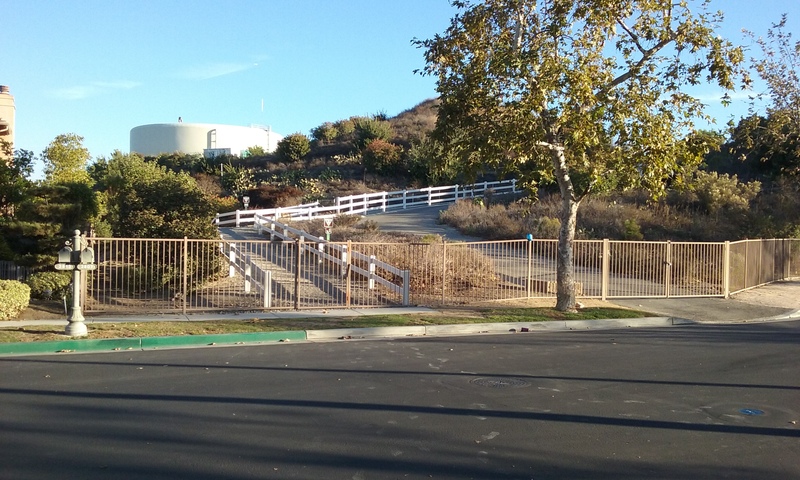 There’s an access road to the east that goes uphill and if the gate is open you can go to another water tank. It isn’t more than 700 ft from the other one but this one feeds La Mirada. The tank you see while driving on Rosecrans from the west, is the Fullerton one. It is also the water tank that you see from the view spot of Castlewood Trail. 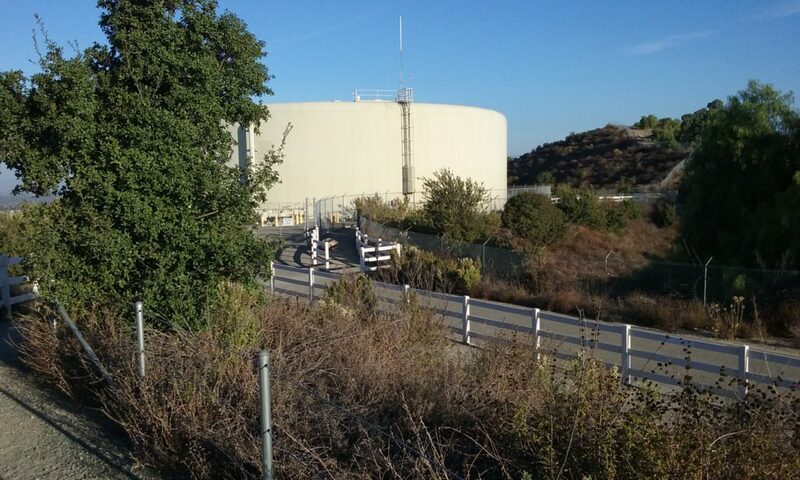 Looking from the water tank to Castlewood Trail is in the south-east direction. Looking from the water tank toward the place you parked is in the south-west direction. On the way to the water tank there’s a branching of the trail where one side goes straight (to the water tank) and the other to the left and down. If you take it down you may find yourself in a loop; a small loop but fun in that it passes by a number gazebos. There’s signs that identifies some trails and trail ends as part of the home owners association. 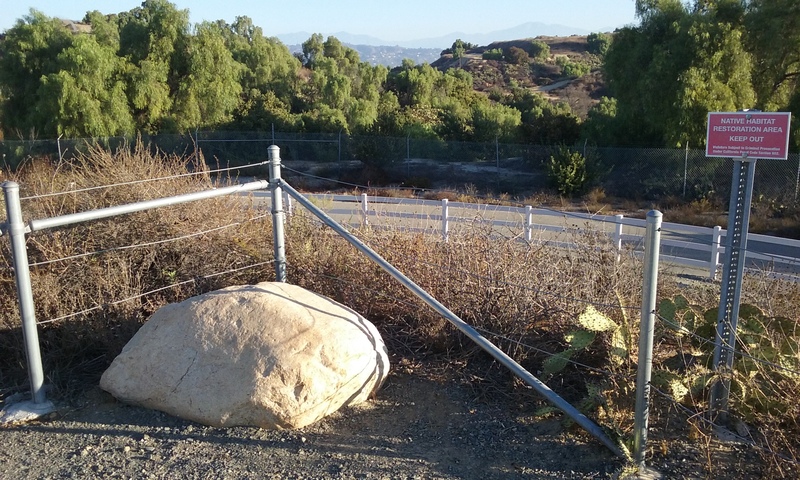 (That pretty much makes it clear that the rest of the trail –the vast majority– are maintained by the county. It may not be worth a look at a map to make that loop, but one is offered below. Just wander around. 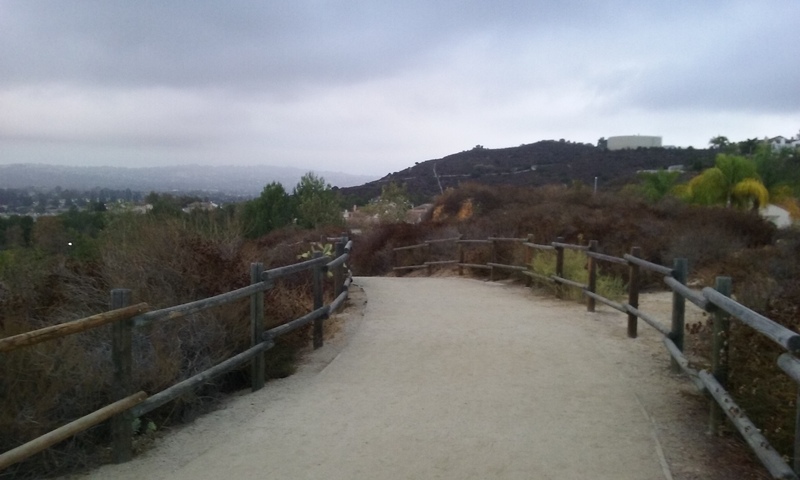 Be assured that the trails that go up eventually meet the main trail back to your car. ___There is another way to drive to Hawks Point Trail and it’s fairly easy to get to. From Beach, enter at Hawks Pointe Grand Entrance. 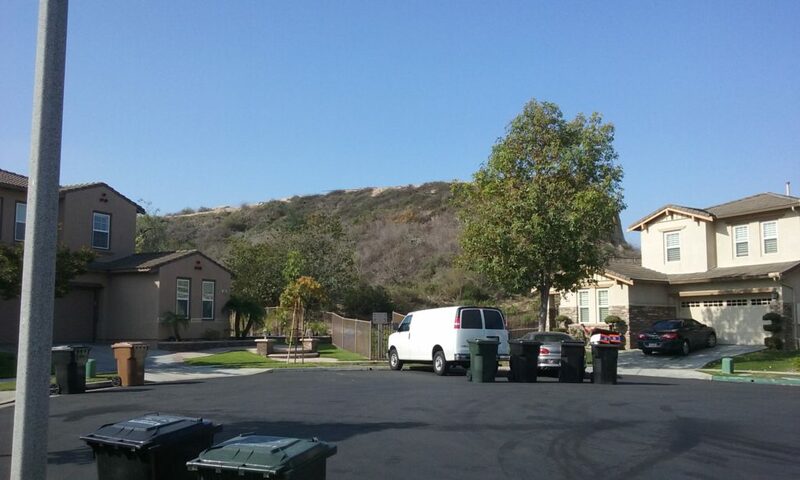 (This is 1/2 mile north of Rosecrans) and go to the end of Hawks Pointe Drive. Parking is OK on the col-de-sac. The map of the small loop (on the left) shows this alternate entrance at the top. Park anywhere near the col-de-sac. That’s a .7 mile loop. 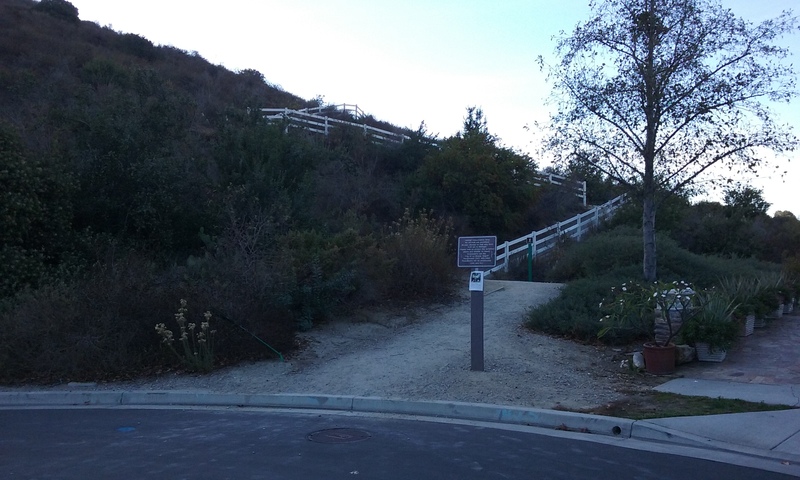 If you enter that loop from where you parked on Rosecrans (on the map; the lower left wider dirt trail) it is 1.1 miles. Click on the picture to see it full screen. Water tank from rest stop No. 2. The rather disappointing end of the trail at Laguna Street cul-de-sac. Rocks are used for sitting at the rest stops. This is an entrance for use by the folks that live at Hawks Pointe. Along the way there is an another trail you can take. This one down to the houses below. There’s several of these interesting turn-arounds near the houses. On Eagle Point Drive looking south at what used to be an incredible view site. 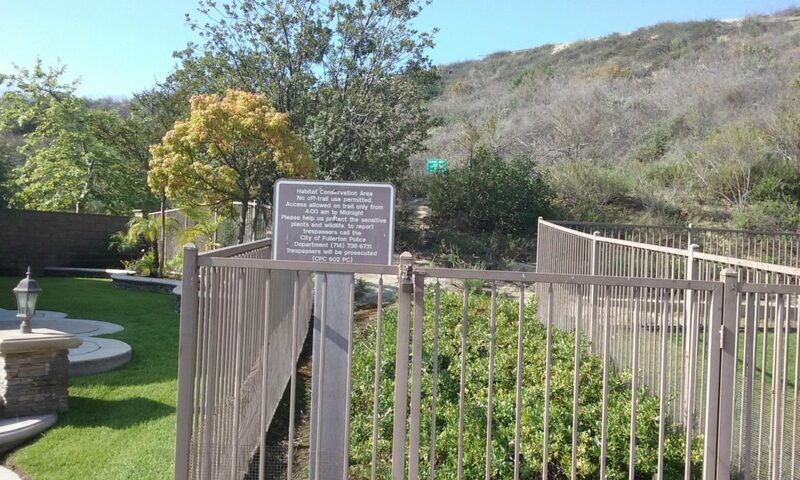 At the end of Eagle Point Drive is this sign which invites us to walk, but the gate is locked. This website is not only to get seniors walking but also to gather suggestions for how Parks and Recreation can improve our experience. An important area of need on this website is information on flora. Please comment (at the right) with pictures and descriptions of plant life for each of the various paths and parks. Ctrl-C the title of this particular web page along with your suggestion and send it to walterclark at symbol roadrunner dot com.